John F. Kennedy International Airport, situated in the Queens borough of New York, is the gateway to the rich and beautiful continent of North America. Originally opened in the 1940s to relieve LaGuardia Airport, the JFK Airport received approximately 59 million passengers in 2016. John F. Kennedy International Airport (IATA code: JFK) is the biggest airport in New York and the hub of American Airlines, Delta Air Lines and JetBlue Airways. Flights to John F. Kennedy International Airport are available from international airlines such as South African Airways, Emirates and British Airways. JFK is a 45-minute drive or a 40-minute train ride from New York’s city centre. Book your cheap flights to and from John F. Kennedy International Airport online! John F. Kennedy International Airport is the largest and busiest airport in the New York airport system. Formerly known as Idlewild Airport, it was renamed John F. Kennedy Airport in 1963, in memory of the 35th President of the United States, John F. Kennedy. JFK Airport operates scheduled flights to all six of the inhabited continents around the world and serves as the gateway to the countries of North America. In 2005, the airport opened Terminal 8, the largest of its six terminals, extending John F. Kennedy International Airport’s capacity to receive even more passengers. Popular flight routes to John F. Kennedy International Airport are from Johannesburg to New York and Cape Town to New York. Treat yourself to the wide selection of word-class shops at John F. Kennedy International Airport. Go window shopping or get what you’ll need for your trip to New York City in all of the terminals. The items that you will find at these shops include cosmetics, flowers, gifts, clothing, mobile phones and accessories, electronics, art, jewellery and more. You can shop for all your duty-free goods and international products at the many retail outlets in all the terminals. Make sure to observe the baggage restrictions at the John F. Kennedy International Airport. For your non-emergency medical requirements, there is a pharmacy in Terminal 4. When you have some time to spare, rest your feet and enjoy a scrumptious meal at the numerous commercial restaurants, cafés and bars situated in all the terminals. Relax at the variety of lounges at John F. Kennedy International Airport. These are available in terminal 4, operated by numerous airlines, including Air India, El Al, Emirates, KLM and Virgin Atlantic. For your baggage, there are carts at the entrances and in the Baggage Claim area (each terminal has a Baggage Claim area). At Baggage Claim areas, you can check the monitors to find the carousel that matches with your flight number. JFK Airport includes several facilities. These include Wi-Fi internet access points throughout the airport terminals. Power outlets are at the circular seating areas and along the seats on the ramps at the end of the terminals. Currency exchange services are available in all the terminals, while ATMs are situated throughout the airport. Additionally, there is the mail centre, as well as public phones. Fairfield Inn by Marriott JFK Airport This 3-star hotel is a short 5-minute drive from John F. Kennedy International Airport. Its main amenities include a fitness centre, valet parking, coffee/tea in the common area, air conditioning, snack bar, restaurant and a bar/lounge. Additionally, a free airport shuttle, free breakfast and free Wi-Fi is available. Allegria Hotel This 4-star beachfront hotel is a 30-minute drive from the JFK Airport. It includes features such as a rooftop terrace, breakfast, an outdoor pool, beach access, a fitness centre, limo car service, air conditioning, a restaurant and two bars/lounges. Free Wi-Fi is also available. The William Vale Hotel This 5-star hotel is a 25-minute drive from John F. Kennedy International Airport. Amenities include an outdoor pool, a rooftop terrace, breakfast, a 24-hour fitness centre, air conditioning, garden and four restaurants. Additionally, free Wi-Fi is available. You will need a valid passport and visa to order foreign exchange. There are 15 Travelex outlets in all the terminals of John F. Kennedy International Airport, except where American Express is used instead. 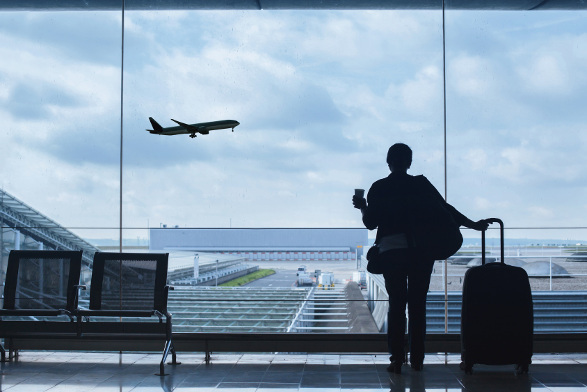 Parking options at John F. Kennedy International Airport include public parking spaces (which work on a first come, first served basis) and privately-owned parking spaces (which you should book online beforehand). In addition, a free airport shuttle and train service are available to get you to any of the terminals. John F. Kennedy International Airport is 30 km southeast of the city centre of New York. Trains, airport transfers, buses, taxis, Uber and car rental options are available to get you from the airport to your destination.